When an investigator attempts to move out of an area containing a monster, or ends his movement in such an area, he must either fight the monster or evade it. An investigator may attempt to evade a monster by making an Evade check. An Evade check is a skill check using the investigator's Sneak value. The check is modified by the monster's Awareness value, which is printed in the upper-right corner of the monster marker's movement side. The difficulty of the Evade check is always 1 unless the monster has a special ability that states otherwise. If the investigator passes the Evade check, he evades the monster and the player may continue his turn as normal, whether continuing movement or interacting with the area. 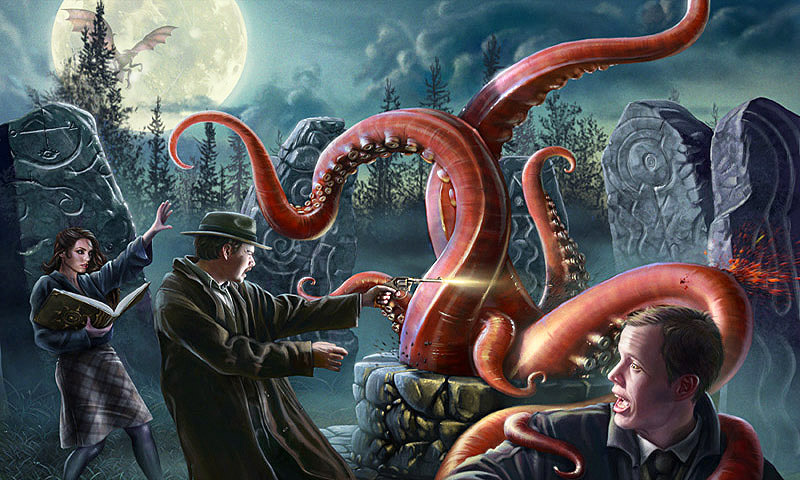 If the investigator fails the check, the monster immediately deals its combat damage to him and combat with the monster begins. An investigator may remain in the same area as a monster after evading it. He simply remains where he is and does not have to enter combat with the monster this phase. This allows an investigator to enter a gate in the same location as evaded monsters. 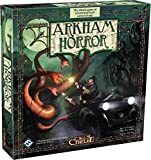 Such an investigator could (if able) evade the monsters during the Movement Phase, and enter the gate during the Arkham Encounters Phase. Example: In the example above, if Pete successfully evades the Star Spawn, he could choose to remain in the Northside area without fighting it for now. However, once the next Movement Phase takes place, he'll have to deal with the Star Spawn once more (by either evading it again or fighting it). If there is more than one monster in an area, the investigator must evade each monster in turn, in any order he chooses. If he fails to evade a monster, the monster deals its combat damage to him and combat with the monster begins. If he defeats the monster, he must still fight or evade any monsters in the area that he has not yet either fought or evaded. Regardless of whether or not any further evade attempts succeed, the investigator's movement is finished as soon as he fails even one evade check. Example: If the Star Spawn in the example above was also accompanied by a Shoggoth, Pete would need to evade both of them to keep moving to the Curiositie Shoppe. If Pete decides to evade the Star Spawn first and fails the check, he can no longer move. Assuming he wins the ensuing combat with the Star Spawn, he must still either fight or evade the Shoggoth. Sometimes monsters appear as the result of a location or gate encounter. An investigator can evade these monsters just like any others. 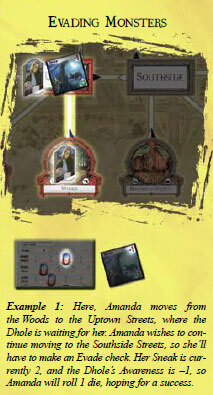 However, these monsters never remain on the board after the encounter is resolved. If an investigator evades such a monster, immediately return the marker to the monster cup.